DAY 7: RELAX IN TOPAS ECOLODGE RESORT AND VISIT SURROUNDING VILLAGES (B, L). Our guide will welcome you at the airport. Then, drive to Hanoi to check in hotel. In the afternoon, we will offer you a kid friendly tour for your family, you will visit to Battrang Ceramic village where you can see many colourful products of local people, especially, you can see how artists work to make beautiful potteries, you can join them to try your ability to make ceramic products, your kids will be excited to play with clays and colours. Finish your work, you can bring back home your products for souvenirs. 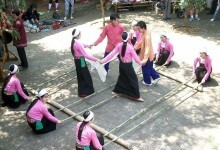 Drive back Hanoi for a nice show of water puppet at the theater which may fascinate your children. Diner and stay overnight in Hanoi. 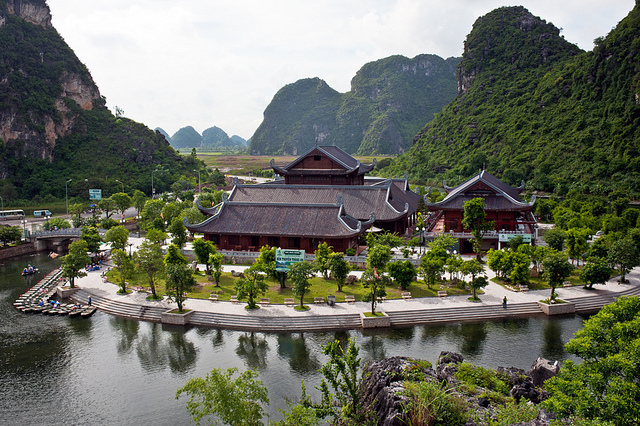 In the morning, you will depart for Ninhbinh, it will take about more than 2.5 hours to get there. 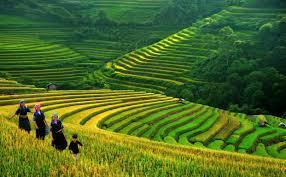 On arrival, you will visit Hoalu, the ancient capital of Vietnam and enjoy peaceful scenery of this countryside. 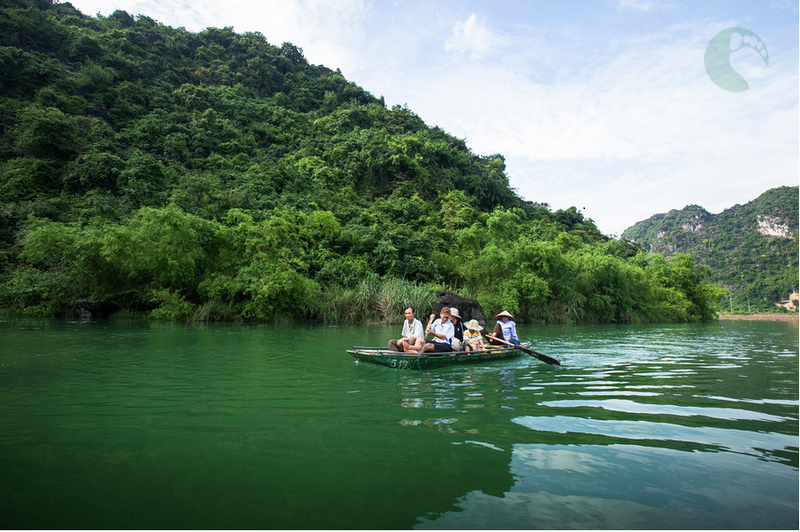 Stop at a local restaurant for lunch, in the afternoon, your guide will take you to Trangan, another wonderful landscape of Ninhbinh. You will take 2 hour rowing boat trip to amazing nature. That is time for you to discover the labyrinth of caves in Trangan. You will get through many narrow, long and dark caves. Then come to quiet lagoons surrounded by high limestone mountains. All of them make a wonderful landscape for you to experience! The boat trip finish and catch your car back Hanoi. Dinner and stay overnight in Hanoi. 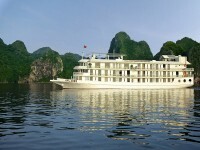 In the morning, our guide and driver will meet you at the lobby of your hotel and drive to Halong bay, it takes us about 4 hours to arrive the harbor where you get on a luxury cruise and start your dreaming cruising in Halong bay. 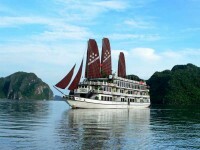 Have lunch on boat and spend the afternoon relaxing and contemplating wonderful scenery of Halong bay. 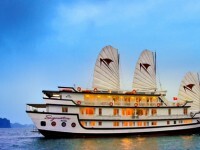 Dinner and stay overnight on boat in Halong bay. 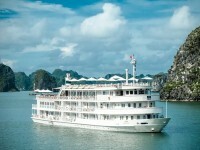 Good morning Halong bay! Wake up and look out the window to see sunrise in Halong bay. Then come up to sundeck to take part into some morning exercises and enjoy fresh air of the sea and forest. After breakfast, our boat will push off and start another cruising. 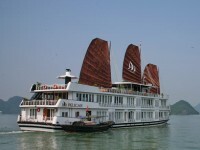 That is great time for you relax and comfort yourself on boat. 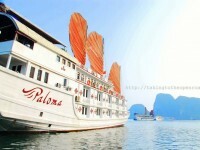 Enjoy gorgeous scenery of Halong bay and take hundreds of photos for life experience. Have lunch on boat and then say goodbye to our crews, we finish our cruise at the harbor where our driver waiting for you and our guide will take your family to Tuan Chau Island Marina, you will enjoy 25-minute sightseeing flight at 13h20. 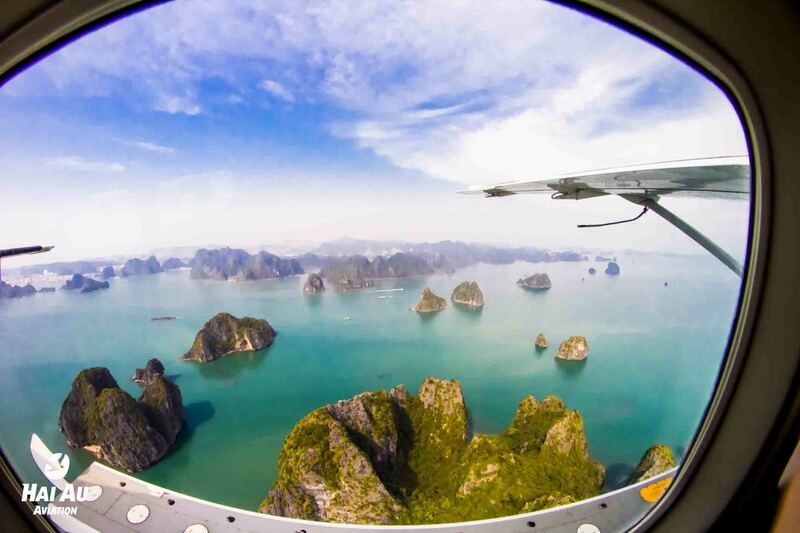 It will take you to the highlights of Ha Long Bay, with amazing views over the magnificent landscape of limestone pillars reaching up from the green waters. The islands, scattered all round, have different shapes which provoke the imagination and recall the passage of time, waiting thousands of years to seek justice in Heaven. The sightseeing tour will be unforgettable as you can admire this breath-taking beauty from the top of view. 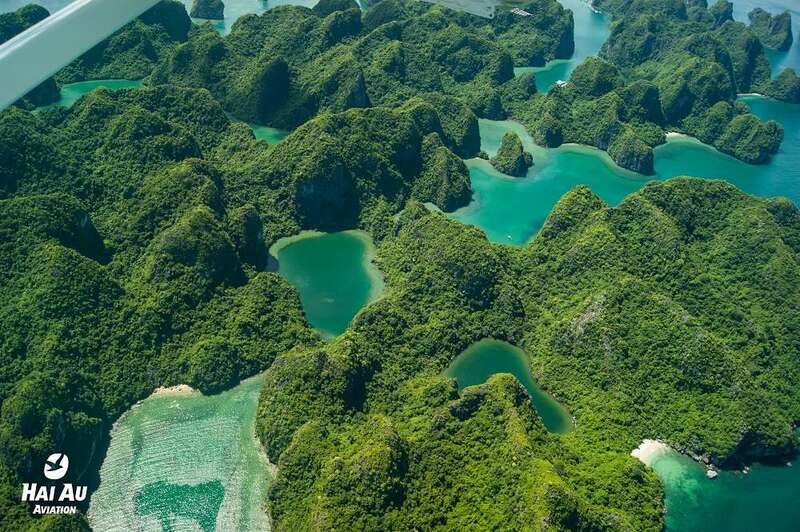 • Dau Be Island: Located in the southeast of Halong Bay, 500 meters to the east, from the Bai Chay Tourist Wharf about 28 km, in a gland located in the outer archipelago of Halong Bay (Lan Ha Bay estuary), standing between Tra Ngu islands and Da Le Island. • Cong Do island: On the south-east side of Halong Bay, about 25 km from Bai Cháy Wharf, Cong Do is in Bai Tu Long Bay in the region which recognised as the World Heritage. It has an area of 23,363 sq. m, and its mountain reaches a peak of 172 m. The island features many lagoons, which are the residence of numerous species of sea-life, such as shrimp, crab, fish, squid and aquatic plants. • Bo Hon island: Bo Hon Island or Soap-Berry Tree Island, not only because of its splendid scenery, but also as it is one of the largest in the area. There are many grottoes located here, such as the Surprise, Luon, Virgin and Male grottoes. There is also a concentration of high mountains with vertical cliffs like citadel wall; mountains follow closely make a huge beautiful watercolour picture on the sea. 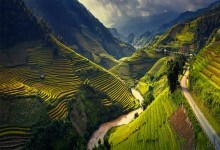 After your 25 minute flight, our guide and driver will meet you and transfer to Hanoi. Overnight in Hanoi. We leave Hanoi in the morning. Get out of the busy city, heading to the brand new highway and drive to Lao Cai city in about 5 hours, you will have chance to enjoy peaceful countryside of Vietnam along the way. The highway runs along Red River, the biggest river in the North of Vietnam, you will see the changing of geography from Red River Delta to Northern mountainous province of Vietnam. Go back to your hotel, dinner and stay overnight in Topas Ecolodge resort. Today is free and easy day for your family, you can relax in your beautiful resort or walk around to enjoy wonderful scenery. If you like to walk longer distance, you can ask our guide and driver to take you to some villages nearby to wonder around and meet local people, learning about their life and seeing domestic animals which may fascinate your children. 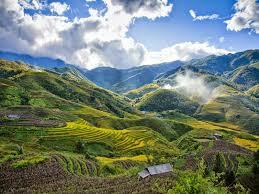 Enjoy fresh air of mountains and forests, take hundred of great photos in Sapa. Spend your afternoon at your resort to enjoy quiet and peaceful atmosphere of this marvelous place. Stay overnight in Topas Ecolodge resort. In the morning, our driver will take you to Fansipan Legend Cable Car Station for conquering Fansipan Mountain Peak (3.143 m above sea level) by the cable car. As you know the cable car in Sapa is the world’s longest and highest cable car, running up from sleepy Sapa Town in Lao Cai Province to the peak of 3,143-meter Fansipan Mountain, known as Indochina’s rooftop. Enjoy the view from the highest point of this incredible mountain. The lush green and subtropical vegetation makes this mountain really very beautiful. Take some pictures for unforgettable experience from the top. After enjoying fantastic scenery then get cable car back to Sapa for lunch. After lunch, drive back Hanoi, you’ll take about more than 5 hours to arrive Hanoi. 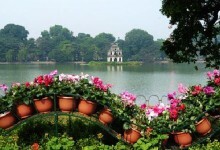 Stay overnight in Hanoi. Pack up everything and our guide will meet you to drive to the airport to catch your flight back home. End of our services. Thank you very much for joining our tour. End of services.